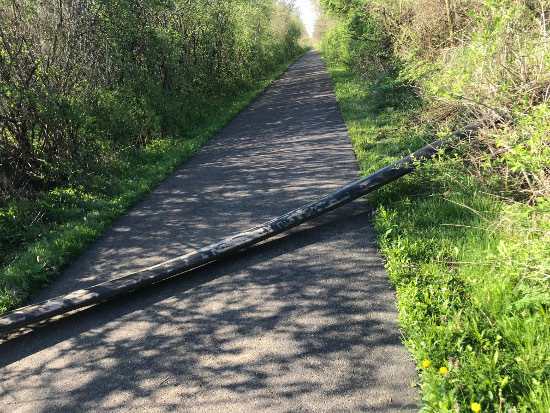 Thornville, OH - From Karen K: "[On the TJ Evans path network, south of Heath, OH, between Davis Dr. and Ridgely Tract Rd] ...there is a huge hose crossing the path. If someone is not paying attention they could get seriously hurt. A farmer has this hose crossing miles in the area." Warren County, OH - Trail re-alignment construction may cause intermittent closures on the Little Miami Trail near milemarker 29.5, just south of Morrow, Ohio. The estimated construction time-frame is April 15 - May 3, 2019. Does Your City Have a Bike Mayor? Who is to Blame for E-Bike Brake Issue? Shared Micromobility Use Climbing in the U.S.
OH - Affected trails include the Hoover, West Branch, Mahoning Valley and Towpath Trails. Learn more. CA: Why aren’t the bridges over the 710 being harnessed for safety? Wayne County, OH - "...work is once again underway on the current 2.4-mile project of The Heartland Trail from Forrer Road to Marshallville. Completion of the project is anticipated for May. A ribbon cutting date will be announced when ready..."
To learn more, read the latest e-news from Wayne County Rails-to-Trails. CAN: Are the Victoria bike lanes too narrow? Crowdfunding Can Reduce Risk of "Bikelash"
NY: Petition to ban bike lane on Queens Blvd. IL: What Should We Do About Cyclists Who Don’t Play By the Rules? TX: Will electric scooters doom downtown's bike program? Stark County, OH - From starkparks.com, "... Trail crews are working to smooth out the trail surface (beginning north and working south) throughout April. We encourage use of the Olde Muskingum Trail [in Canal Fulton] parallel to the Towpath Trail from Cherry St. to 40 Corners..."
AUS: Are separated bike lanes key to Canberra's future as a cycling city? NY: Does green light for Putnam’s greenway mean red light for Riverdale’s? Stark County, OH - From starkparks.com, "Class 1 e-bikes are permitted to ride on multi-purpose trails (crushed limestone or asphalt) as part of a pilot program throughout 2019. The speed limit for all users 15 mph with signs posted along the trail." NYC: Why Did De Blasio's DOT Rip Out A Popular Protected Bike Lane? A portion of the trail detour has opened. Stark County, OH - From starkparks.com, "Flooding along the trail is present in the low lying areas including north of Lake Lucerne near Canal Fulton, under Lake Ave. in Massillon, and Wooster St. in Navarre. Crystal Springs, Lock 4, and St. Helena Heritage Park parking areas are also closed at this time"
AZ: Cycling in Arizona: What are the rules of the road? CVNP, OH - "The Towpath Trail between Deep Lock Quarry Metro Park and Hunt House is now open! NE OH - Read the latest edition. Will Ohio Keep Widening Highways? Are Bikes the Future of Urban Mobility? CA: Why is Los Angeles so Dangerous for Cyclists? Urbana, OH - "...The SKT is totally open from County Line Road to Bellefontaine. VA: Could the Richmond region build a 40-mile bike trail from Ashland to Petersburg? NYC: Why Is The Queens Boulevard Bike Lane Still In Limbo? CAN: What good is a bike lane if someone parks their car on it? WA Will Mayor meet the Seattle Council’s downtown bike lane 2019 deadline? Canal Fulton, OH - From starkparks.com, "The trail will be closed between Butterbridge Ave. and Lock 4 Trailhead [a 1.3-mile segment] on March 19, 2019 for tree work along the trail." Summit County, OH - From summitmetroparks.org, "The Towpath Trail will be closed between Manchester Rd. and State Route 224 for utility work associated with an Army Corps of Engineers invasive species project. "The closure begins Tuesday, March 19 and continues through early June 2019." 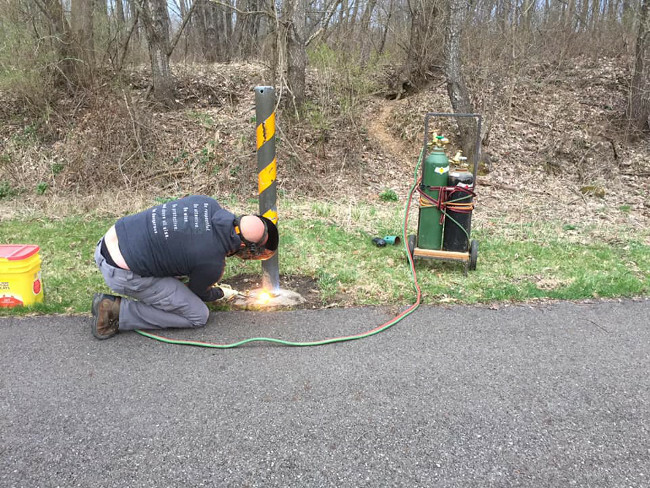 OH - From starkparks.com, Middle Branch Trail: "Maintenance work on a gas line will close a portion of the trail March 18 to March 22. Access will not be available between 55th St. and the southern trail split at Veterans Park during those dates." Hoover Trail: "A recent construction project to widen Market Ave. has closed the on-road connection to the Hoover Trail at the Market Ave. and Easton St. intersection. The official closing sign is placed at Stone Crossing St. and Marelis Ave."
Mahoning Valley Trail: "A project to construct a new boat launch at Deer Creek Reservoir will close the park until March 25, 2019. Parking for the trail will not be available and access to the park will be closed during construction." Learn more about Stark County trail construction and closings. Huron County, OH - From firelandsrailstotrailsinc, "We had another big turnout for today's workday, so we split the crew in two and sent one to dewinterize the Chapin Bridge in Wakeman while the other cut dead trees near Monroeville." SW OH - "There is a temporary closing of the Northern section of the Simon Kenton Trail at the SR 296 intersection. Contractors are installing new RR warning lights and a gate for that crossing..."
WA: A pedestrian in Seattle wants to know why bicyclists aren't stopping at crosswalks. Was Tragic Bicycling Death Preventable? D.C.: Is Capital Bikeshare becoming less reliable? NC: Could a 'road diet' on Charlotte Street delay emergency responders? IND: Have bike-sharing firms hit a dead end in India? Jamestown, OH - "Greene County Parks & Trails (GCP&T) will be closing the Xenia-Jamestown Connector between Waynesville-Jamestown Road/S. Maple Street and SR 72/Limestone Street, [in] Jamestown, beginning as early as Monday, March 11, for brush removal in preparation for full-depth restoration of the paved trail. CO: Bike lanes: Which side are you on? Will Electric Bikes Catch on in LA? CA: Horrible Week for Vision Zero Casts Shadow over S.F. Are Our Streets Dangerous by Design? CAN: London's latest bike-lane battleground? For more news, visit the 2019 Archive.